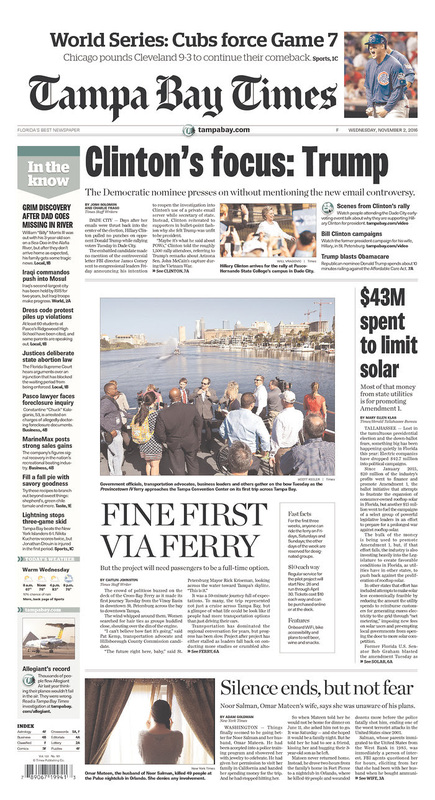 Consider the eye-grabbing Tampa Bay Times’ front-page headline Wednesday: $43M spent to limit solar. Beyond the silliness of assuming that every dollar utilities donated this cycle is part of a plot to fight rooftop solar — as if there is nothing else they care about — the story is screwed up six ways to Sunday. If a politician were to use these numbers, PolitiFact would rate them somewhere in the range of Mostly False to Pants on Fire. Hmm … $20 million to Amendment 1 plus $15 million on campaigns adds up to $35 million … not $42.7 million or $43 million. Where’s the other $7.7 million to $8 million? Keep reading. OK, so FPL donated $14.2 million toward “state legislative campaigns” and an additional $8 million to Consumers for Smart Solar for $22.2 million. If that sounds high, it’s because it is. The Division of Elections shows the sum of all of FPL’s donations to candidates and political committees excluding Smart Solar this cycle is $6.1 million. Combine this with about $8 million to Smart Solar, and you get roughly $14.2 million. Not $22.2 million. Could this account for the $8 million discrepancy between the headline and second paragraph? In print, it’s $13.3 million total. Online, it’s $20 million. Which one is right? Checking the Division of Elections database, it turns out neither is correct. Duke gave $6.7 million to Smart Solar and about $1.3 million to other political committees and candidates for a total of a little under of $8.1 million. The magnitude of this error is in the $5.2 million to $11.9 million range. Tampa Electric Co., the third largest utility, has pumped $4.7 million into the political system, including $3.8 million for the amendment, and Gulf Power has invested $2.5 million, including $2.2 million to the political committee backing the amendment. On the positive side, the Gulf Power numbers appear to be correct! Unfortunately, TECO’s numbers are wrong multiple ways. First, TECO did not give $3.8 million to Smart Solar; it gave $3.2 million. Second, the story suggests $0.9 million went to other political committees and candidates or, if we account for the first error, $1.5 million. Wrong either way. The Division of Elections shows about $1.7 million. Add this to $3.2 million in Smart Solar dollars, and the total is $4.9 million, not $4.7 million as reported in the story. If you’re keeping track, the total of the actual figures for all the utilities combined is $29.7 million, including Smart Solar contributions. The Herald/Times inflates this total by more than 40 percent, and the Pulitzer-promoting Tampa Bay Times put a $13 million error on its front page. How the Herald/Times can jointly botch something this badly is mind-boggling.